Need a good conference to go to? Are you tired of all these tech conferences where the focus is on the sponsors instead of the content? I was so I started looking around to see what other conferences were available that focused on the content first and I came across the StrangeLoop conference in St. Louis. 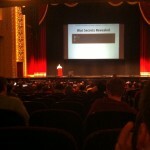 You can visit this conference over at their website at http://www.thestrangeloop.com. It’s usually in the fall and starts on a Sunday, at least the workshops start on a Sunday if I remember correctly. I didn’t get to attend the workshops last year cause they sell out so fast, so you had better reserve your spot soon, as the conference sells out rather quickly, even with around 1000 attendees!! 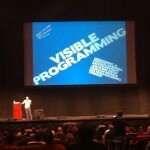 The focus of the conference is web development but there is a rather large functional programming group there. Coming from a .net background, I had a lot to learn, but I am learning more and more about the web dev world and how things work over in that space. I highly recommend this conference if you are looking for something very different from the normal conferences. 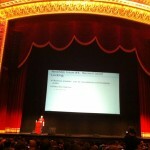 You are currently browsing the archives for the StrangeLoop category.